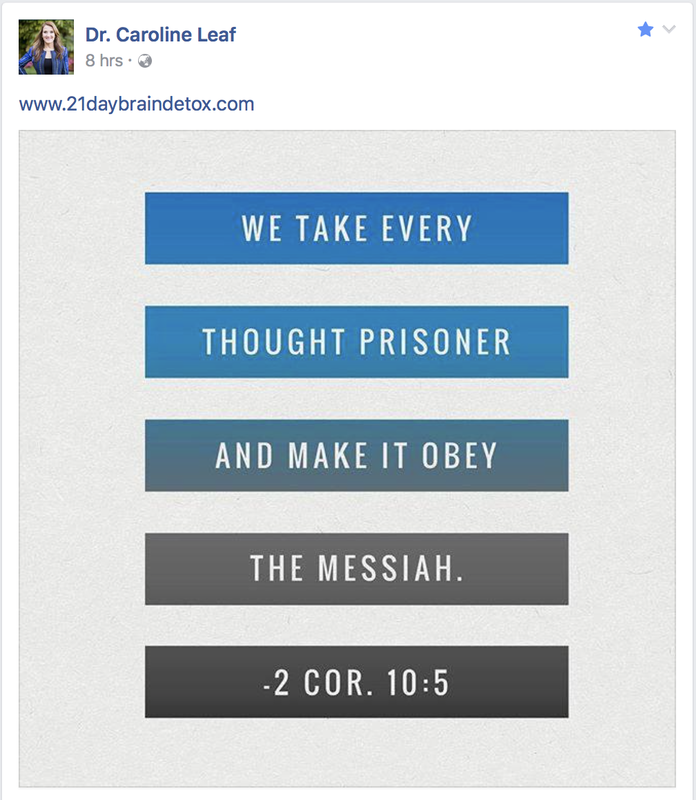 Sure, part of it does, but does the scripture 2 Corinthians 10:5 lend any credibility to Dr Leaf’s idea that thoughts are toxic and we need to take them captive to detox from them? 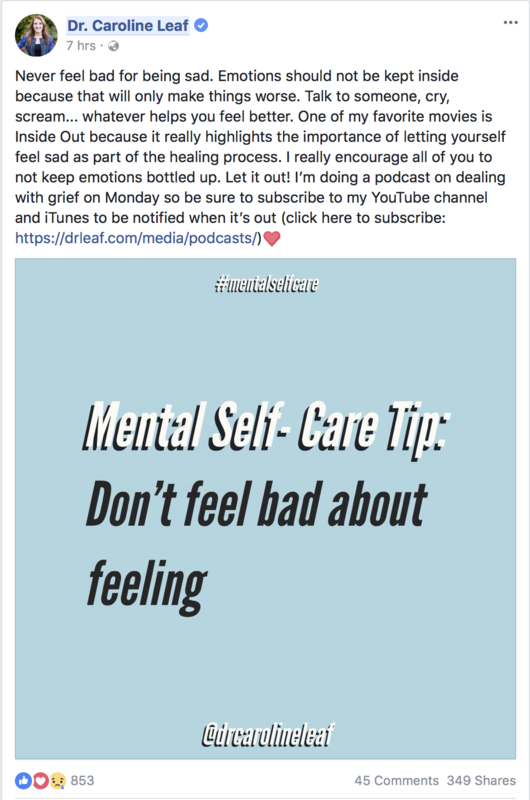 She may want it to – her 21 Day Brain Detox is so scientifically anaemic that I can understand her desperation to bolster its credibility any way she can. Unfortunately for Dr Leaf, misinterpreted scripture isn’t the elixir her teaching needs. Similarly, the translation from the original text is more specific than general. The verb used for “bringing into captivity” is aichmalōtízō, “to make captive: – lead away captive, bring into captivity” which is in the Present Active Participle form of the verb. The present tense represents a simple statement of fact or reality viewed as occurring in actual time. The active voice represents the subject as the doer or performer of the action. The Greek participle corresponds for the most part to the English participle, reflecting “-ing” or “-ed” being suffixed to the basic verb form. Actions completed but ongoing or commands are different verb tenses (see https://www.blueletterbible.org/help/greekverbs.cfm for a better explanation). Paul wasn’t making a general statement, but a specific statement about what he would do in his present time, not the future. So, Paul isn’t telling us to “bring every thought captive into obedience to Christ”. Paul is issuing a smack-down to his critics, not telling us to fight our thoughts. Dr Leaf is guilty of perpetuating a common scriptural misunderstanding in order to try and validate her already weak teaching. Our thoughts are not toxic. We do not need to detox our brain. Misquoted phrases of scripture taken out of context doesn’t change that. Dr Caroline Leaf is a communication pathologist and self-titled cognitive neuroscientist. She wrote a PhD on a learning program developed for an educational setting. She is not a medical doctor. She is not a psychologist. She has no experience or training in the diagnosis and management of mental illness. She is no more qualified to give advice on mental illness than my hairdresser is. Her statements is a nonsense, nothing more than a scarecrow fallacy. Yes, pushing people away and locking them up and drugging them against their will is not the solution to the problems of life, that’s why no one does it. If people were locked up or drugged against their will because of “the problems of life” then we’d all be locked up and drugged. The only people that are forcibly treated are those with the most serious of mental illnesses whose condition has deprived them of the insight they need to make the decision for themselves. Even then, the consent for treatment is given by the next of kin, and if no next of kin can provide consent, then the consent is usually made by a independent statutory body so there’s no conflict of interest. 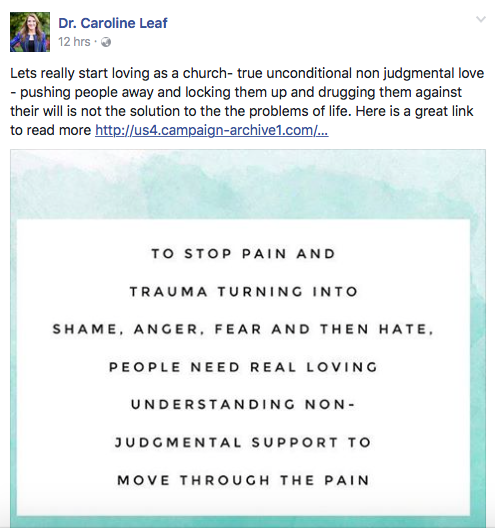 That Dr Leaf continues to make such inane statements about mental illness confirms that she is not fit to give the church, or anyone else for that matter, any advice on mental health. She may have a PhD in communication pathology but that is a highly specialised field that doesn’t even begin to cross over to clinical knowledge of mental illness. 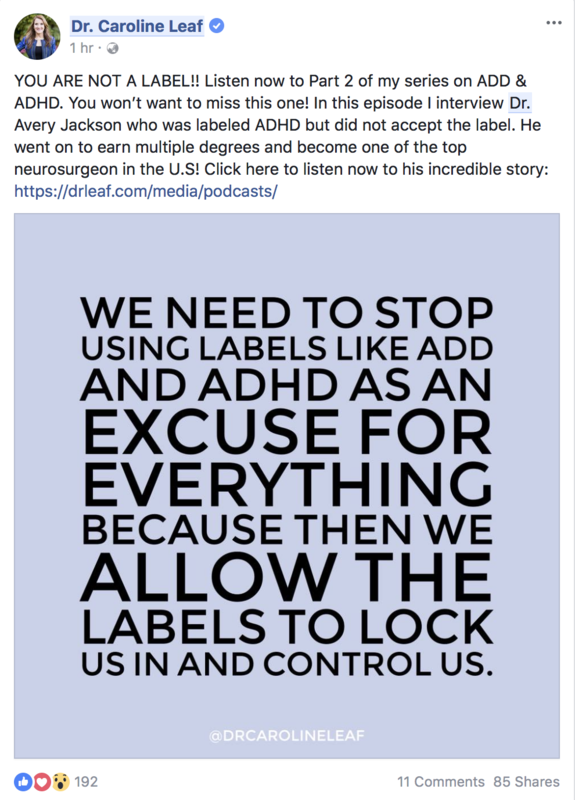 Dr Leaf has chosen to fill her vacuum of mental health experience with the opinions of Mad In America, a group that’s irrationally biased against modern mental health care. She regurgitates their creed almost verbatim – mental illness is over diagnosed, psychiatric medications are useless and dangerous, and Dr Leaf also claims that psychiatric medications are only prescribed to bring the cabal of the American Psychiatric Association and the pharmaceutical companies more power and money. Psychiatric medications are more helpful than harmful (Leucht et al, 2012, Torniainen et al, 2015). I’ve discussed this in blog posts in the past. Yes, they’re not without their side effects, and they’re not for every patient, but they have their place in psychiatric care. 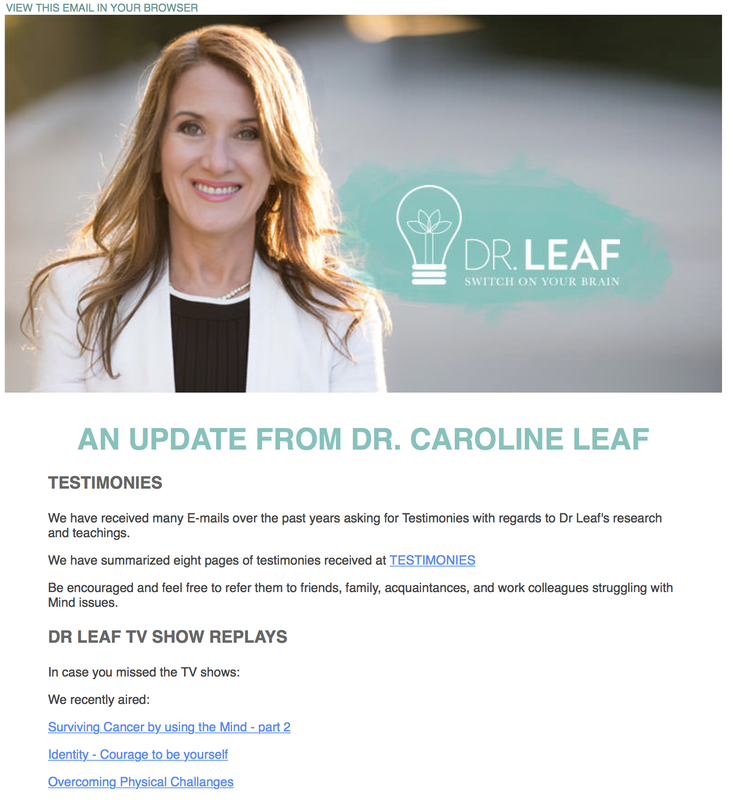 That Dr Leaf can’t or won’t review this evidence is just another indictment against her ministry. That she actively promotes the idea that pharmaceutical companies and the APA are actively attempting to harm people for their own power and riches is scandalous. 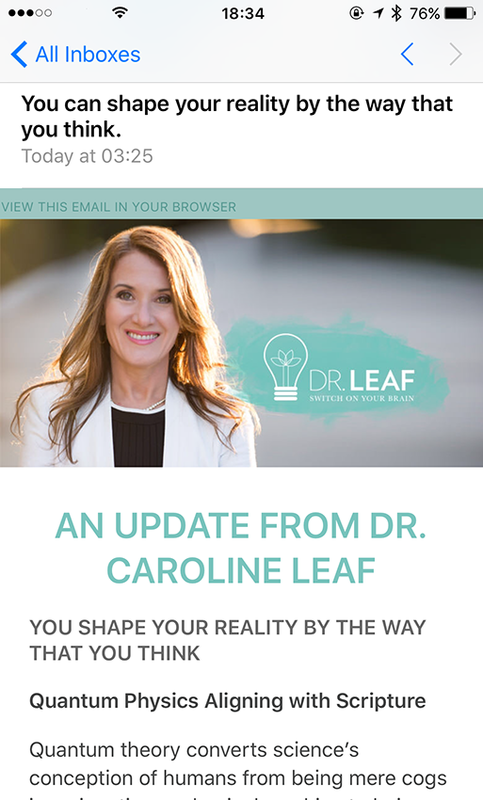 If Dr Leaf was serious about promoting good mental health through the church, she should stop promoting baseless anti-psychiatric propaganda, and start encouraging Christians with mental illness to seek the best treatment available, whether that be medications or counselling or both. She should also start teaching the church the truth about mental illness … That mental illness isn’t caused by poor choices or toxic thoughts, but because of genetic abnormalities that make the affected persons brain more vulnerable to external stress. Because to stop turning pain and trauma into shame, anger, fear and then hate, people need correct information to allow them to offer real loving understanding and nonjudgmental support to move through the pain. At the moment, Dr Leaf isn’t offering the church anything even close to that. Ah, Monty Python – six university students with a penchant for satire who changed the face of comedy. They say that “Imitation is the sincerest form of flattery”, and if that’s the case, Monty Python should be very flattered! Nearly five decades later, you still hear people throwing around lines from their sketches and getting a laugh. Their movie, “The Life of Brian” remains one of the most critically acclaimed and most controversial of all movies. It was the story of Brian, born in the stable next door to Jesus, and who later in life unintentionally becomes the focus of a bunch of people who mistakenly believe he’s the messiah. One morning he opens his window to find a large crowd of people waiting for him outside his house, leaving his mother to try and dismiss the crowd with that now famous rebuke. The crowd at Brian’s window aptly demonstrates a quirk in our collective psyche. We humans have a bipolar tendency to latch on to something that seems like a good idea at the time and blow it’s benefits out of all proportion, only to later discover it wasn’t as good as our overblown expectations and unfairly despise it on the rebound. Anti-depressant medications are a bit like Monty Python’s Brian. Back in the late 1980’s when Prozac first came on the market, doctors saw it as the mental health messiah. Prozac improved cases of long-standing severe depression and was much safer in overdose compared to older classes of psychiatric medications. The idea that depression and other mental illnesses were related to chemical imbalances fit nicely with the cultural shift away from the Freudian psychotherapy model that was prevalent at the time. People were describing life changing experiences on Prozac: “One morning I woke up and really did want to live … It was as if the miasma of depression had lifted off me, in the same way that the fog in San Francisco rises as the day wears on.”  Prescribing for Prozac and other SSRI anti-depressants took off. Fast forward to the present day, where the pendulum has swung back violently. Anti-depressants are considered by some to be nothing more than over-prescribed placebo medications used by a pill-happy, time-poor culture demanding simple cures for complex problems. Some commentators have gone so far as to label anti-depressants as an evil tool of the corrupt capitalist psychiatric establishment. “Anti-depressants are not the messiah, they’re very naughty boys, now go away!” they exclaim. But are anti-depressants really the enemy, or could they still be friendly, even if they’re not the messiah? In the Medical Journal of Australia this month, two Australian psychiatrists, Christopher Davey and Andrew Chanen, carefully review the place of anti-depressants in modern medicine . It’s a very balanced and pragmatic view. They bring together all the evidence to show that while anti-depressants aren’t the elixir of happiness that we once assumed, they also don’t deserve the accusation that they’re nothing but fakes. When drugs are scientifically tested, they’re usually studied in placebo-controlled trials. The medications are given to one target group of people and a fake medicine is given to a similar group. In the best trials, the patients aren’t aware of which they’re actually getting, and the physicians aren’t aware either. That way personal bias and expectations can be reduced. To reduce these biases even further, other scientists can pool all of the quality research on a topic in what’s called a meta-analysis. Trials on anti-depressants initially showed very strong positive results, or in other words, the patients on the drug did much better than those on the placebo. Anti-depressants lost a lot of their shine in the last decade or so as researchers began pointing out that the placebo effect, the number of patients improving on the fake medicine, was also very high. There was also the serious, and largely legitimate accusation that drug companies ignored trials with less favourable results to make their drugs look better. The reputation of anti-depressants was forever tarnished. One of the most out-spoken critics of anti-depressants, Harvard psychologist Irving Kirsch, tried to show that when all of the trials on anti-depressants were taken together, the placebo effect wasn’t just close to the effectiveness of the real medicine, but was actually the same. The problem with Kirsch’s analysis is that not all trials are created equal. Some have negative results because they were poor trials in the first place. When experts reapplied Kirsch’s methods to the best quality trials, the results suggested that anti-depressants are still effective, but for moderate and severe depression . Anti-depressants for mild depression weren’t of great benefit. So if anti-depressants aren’t useful for all cases of depression, are other therapies better? This is where psychological therapies come in to the equation. Those who are the most vocal opponents of modern psychiatry and psychiatric medications are also the most vocal promoters of the benefits of talking therapies. They won’t admit it, but there’s usually an ideological bias or financial incentive driving the feverish worship of talking therapies and their overzealous defence. Though in the cold hard light of evidence-based science, talking therapies aren’t much of a panacea either. Pim Cuijpers, a professor of Clinical Psychology in Amsterdam lead a team who reviewed the effectiveness of trials of psychotherapy, and found that their effectiveness has also been overstated over the last few decades. Quality studies show that talking therapies are equivalent in effectiveness compared to anti-depressants for depression . What’s important to understand about talking therapies in general is that any benefit they have is related to changing behaviour, but that’s not dependent on changing your thoughts first [4-6]. Talking and thinking differently is fine, but unless that results in a change to your actions, there will probably be little benefit. The million-dollar question is how to apply all of this. If talking therapies have the same benefit as anti-depressants, then do we go for tablets before talking or the other way around? Are both together more powerful than each one alone? Some overseas guidelines recommend this order based on projected bang for your buck. While talking therapies are initially more expensive, they seem to have a more durable effect than medications, which are initially cheaper and easier, but have a greater cost with prolonged use . In other words, if you learn better resilience and coping skills, you’re less likely to fall back into depression, compared to the use of the medications. At this point in history, we seem to finally be finding some balance. Just as anti-depressants aren’t the messiah, they’re not the devil either, despite the vocal minority doing their best to demonise them. With a few decades of research and clinical experience since Prozac was first released on to the market, we’re finally getting an accurate picture of the place of talking therapies and medications in the treatment of depression. Both are equally effective, and each have their place in the management of mental illness in our modern world. Davey CG, Chanen AM. The unfulfilled promise of the antidepressant medications. Med J Aust 2016 May 16;204(9):348-50. Cuijpers P, van Straten A, Bohlmeijer E, Hollon SD, Andersson G. The effects of psychotherapy for adult depression are overestimated: a meta-analysis of study quality and effect size. Psychological medicine 2010 Feb;40(2):211-23.
email (with a response provided within 24 hours) via their website https://www.beyondblue.org.au/about-us/contact-us. -> call the National Suicide Prevention Lifeline by calling 1-800-273-TALK (8255). -> Samaritans offer a 24 hour help line, on 116 123.